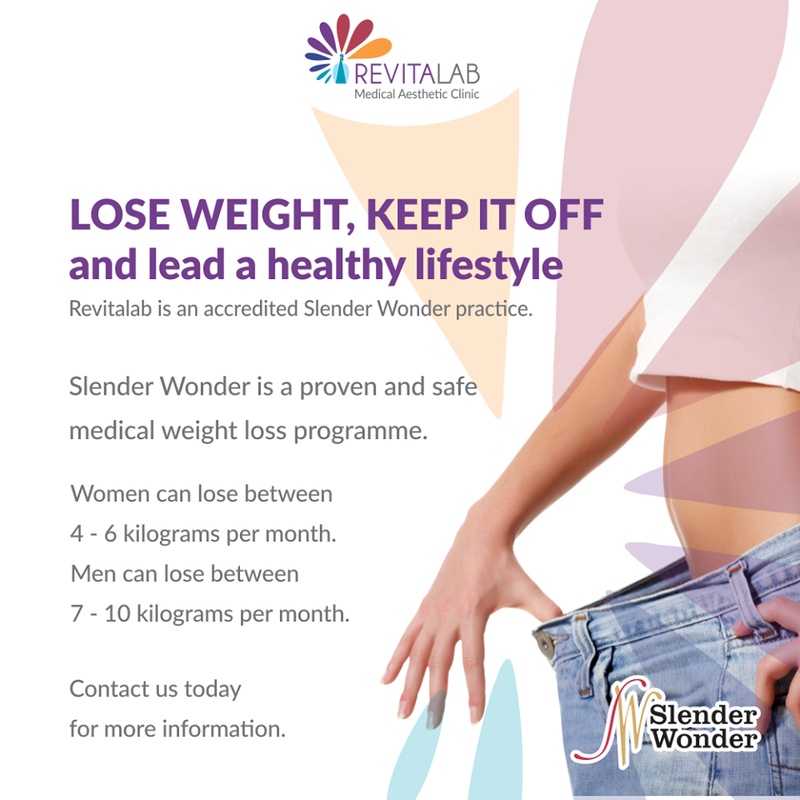 Slender Wonder is a Medical Weight Loss Programme that treats the cause of overweight and obesity, and not just the symptoms. Overweight and obesity are medical conditions and should be treated as such. Set your weight loss goals with your Revitalab Dr and start your journey to a new you. Whether you have 5 kg or 50 kg to lose, this is the medical weight loss programme to help you achieve your goal. The Weight Loss Programme can only be done through an accredited Dr. The medical weightloss program is a formula based on a low- GI eating plan, together with the products as well as a series of injections. Depending on the patient’s starting weight, results have shown that most individuals lose up to 4 – 7 kg in the first month. Results may vary and are patient specific. Once you reach the maintenance phase, your Leptin sensitivity will have been restored and this will help you to maintain your new weight provided you continue to follow a healthy lifestyle! The system is proven to ensure the loss of non-structural “bad” fat and not a reduction in kilograms due to the loss of muscle or water. The system is proven to ensure the loss of non-structural “bad” fat and not a reduction in kilograms due to the loss of muscle or water. This is monitored by performing regular Body Stats. Ask your accredited Doctor about the Body Stat procedure. The Elite Pack (First month’s pack) costs between R2 900 – R3 300. (Medical aids do not pay for the products, but may cover the consultation fees). Weight Loss Phase: Follow the Simeon B meal plan for 4 or 6 weeks. The Simeon B meal plan is in the program Book given to patients on commencement of the Weight Loss Programme. Slender Wonder Activate can be followed if prescribed by your doctor. Slender Wonder Activate is for patients who have been on the programme for a long period. On completion of the 4 or 6 weeks of following the Simeon B meal plan, you will then follow the Go Moderate meal plan for 2 weeks. The Go Moderate meal plan is also in the program book patients receive. The products can ONLY be purchased from your accredited doctor. It is important that you see your doctor bi-weekly or at least monthly during phases 1 to 4 to be weighed and measured.